Maybe a nood question but i'm wondering if there is any way to show the limit of 107% from the top time set in a airo server when type the command !top? I'm asking this because i'm setting a champ witch rules are the ones who doesnt set a time faster than 107% in prequal cannot go for race weekend. Last edited by cargame.nl, Thu, 15 Sep 2016 13:23 . Open Airio.tcd.txt-file and modify TrksList, TrksName, NoReverse and NoPitLane. # space and corresponding track names separated by comma (,). # These tracks don't support reverse configuration. # On these tracks there is no pitlane for SG and DT penalties. Copy these options and when you've copied, change BL1 on the copied one into BL2 and change the title on the copied one into BL2 Options (not necessary, but surely will help you by making this more clear). Change both BL2-words to BL3 (only the latter one is required, but changing the first one as well will make your Tcd-file more clear). # Ignore yellow flags caused in specific BL1R areas. First, change the Track=BL2R to BL3R. After that, copy the Track=BL1R and it's options and then change track on the copied one into BL2R. After this, you may need to use the !node command to have PitEntryNode, PitExitNode, RestrictedZones, LimitedZones, MaxSpeedNodes and NoYellowNodes correct nodes on these tracks. Although this is not required, you may face unintended penalties if you don't update these. But I'm not sure, is it necessary to update these nodes, in other words, I don't know yet, is Airio going to punish you, for example, for driving into restricted area when in reality, you have been on the race track all the time. Not sure yet that is there anything else to update in Airio due to this Blackwood update. I'm not sure, but if i remember correctly, it is displaying 'Demo', because you bought your license very recently. If this is true, that text should change to 'Liced' in near future. Did you buy your licence recently? Airio cannot read license statusses, it can only read your LFSW account (and your race timings there). Set a PB on an S3 combination and you should be sorted. Quote from mbutcher : Set a PB on an S3 combination and you should be sorted. Helped a lot THANK YOU! there has been numerous instances where airio has stated demo racers being licensed while on our demo server (MRc]. I uploaded a refactored layout on my server, and now Airio commands !pb and !stats display data only for those users that had registered a time with the first version of the layout. Users who are now running the layout first time (=who never visited the first version of layout), will still have their best time in !top list, but: !stats and !pb commands display "no data" for them. Quote from EQ Worry : Hello, racers and server administrators! Hello. Can you tell how can I add this extra to my server? I have a drag server and I use it airio. I have an option for accelerating but it does not work even when I write "true"
Think u need to set it to true. Did u reload after changes? command !rld offcourse restart airio also works. There u can set what is shown in !opt for players standard. Last edited by RC-Maus, Thu, 10 Jan 2019 14:26 . Hello! I fixed the problem. DefaultVerbosity=3 , StandardVerbosity=3 These two things were empty and when I wrote "3" it was ok. I don't understand these things for what they are already working on! Thanks for the answer anyway! I tried to search answer for this, but did not found. Does the NumRejoin parameter limit the re-joining after CTRL+P? I think this can't be true since rejoin<>join, NumRejoins to 0 only restricts rejoins, but not joins, right? Last edited by lucaf, Mon, 18 Feb 2019 10:58 . I can't have any effect on these parameters. I'm testing with two players: my 2nd player (not admin/limad) is able to rejoin unlimited times and still after the 1% race progress. What I am doing wrong? I have refreshed and even restarted Airio after setting those parameters. I am running latest Airio Free and I can't see any comments in the documentation pointing that those parameters are only for licensed Airio. edit: maybe worth mention, I am running open configuration with race lenght of 1 hour (/hours=1). That makes the problem? If anyone wants to help me testing this, PM me and let's have some tests on my online server. If/when I find a solution to this, I will edit this post and write it here. Last edited by lucaf, Mon, 25 Feb 2019 06:37 . My name is Andy and run AKM Racing Servers. Clio has been intouch with you about Airo Pro Software which you have agreed to supply to us for &#8364;50 which is brilliant, thanks. Can you let me know how this is payable and will the software be sent as soon as payment is received? Can you please mail software to Andy@AKM-Racing.co.uk and no other address. 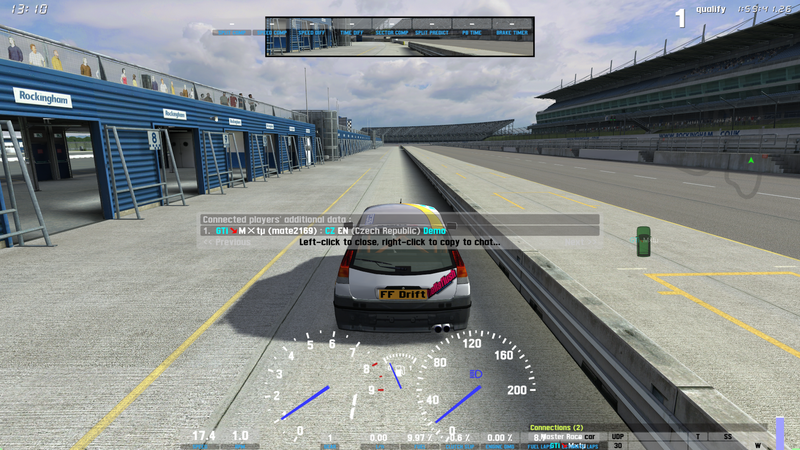 1) Some sort of registration process for the events we run, so drivers register themselves and a car type and then at the specified day & time only registered drivers can connect to the Race Server. 2) Some sort of scheduling for Race Nights, I create a file that runs on a Day & Time that starts Qualifying and Races at given times similar to what lapper can do. Hi Andy, thanks a lot for your interest in the sowtware. You may find the supported ways to transfer the funds here: http://www.airio.eu/Airio_DP.html. If you need some other way for which I can register, let me know. Yes, I'll send you the software to your e-mail as soon as I see the payment, you do not have to be afraid.